Aged progressed to 17 years old. 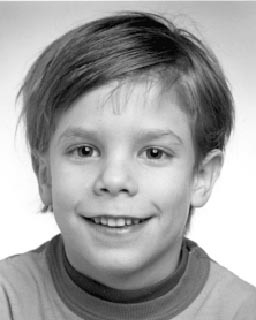 Etan Patz's case galvanized the missing children's movement, raising awareness of child abductions. The 6-year-old vanished one morning in 1979 while walking to his school bus stop in New York's SoHo neighborhood. It was the first time he set off on the trip by himself. Etan became the iconic boy on the milk carton, one of the first children to be featured in that 1980s campaign. Thirty years later, the case remains an open investigation, with no official suspects. Associated Press= NEW YORK (AP) — Police and the FBI are searching a New York City basement for the remains of a 6-year-old boy whose 1979 disappearance on his way to school helped launch a missing children's movement. The stench of death detected by a police dog led police to a New York City basement on Thursday, where they are searching for the remains of a missing boy who disappeared more than three decades ago. 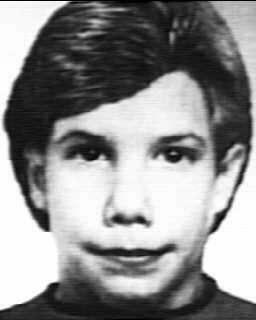 Etan Patz was six years old when he went missing after leaving his home in New York's SoHo neighborhood on his way to school on May 25, 1979. He was the first missing child to have his picture printed on milk cartons. New York police officers and FBI agents were searching the basement underneath a clothing store for Etan's remains -- blood or pieces of his clothing -- throughout Thursday -- just a block away from where he went missing 33 years ago. The basement was home to Othniel Miller, a handyman who had befriended the boy. Investigators questioned the Miller again recently, and as a result of those discussions decided to refocus their attention on the building, according to the law enforcement official. Police didn't say what led to the building, but sources revealed a police cadaver dog picked up the scent of human remains there. NYPD spokesman Paul Browne says the building being searched is about a block from where the family lived. He says the excavation is the result of a recently-ordered review of the case by the Manhattan district attorney and that they expect to be at the site for two to three days, examining a space that now sits beneath a clothing store. Authorities didn't say what evidence led them to that location but a source said that in May 1979, the building housed the workspace of a carpenter who was thought to have been friendly with the young boy. Two law enforcement officials confirmed that an FBI dog had picked up the scent of human remains after police received the tip off that led them to the building. The excavation was part of a review of the case, recently ordered by the Manhattan district attorney, Browne said. 'This was a shocking case at the time and it hasn't been resolved,' he said. The excavation of a Manhattan basement yielded no obvious human remains and little forensic evidence that would help solve the decades-long mystery of what happened to Etan Patz, a 6-year-old who vanished while walking to a bus stop 33 years ago. “I was scared of him,” she remembered. “He had long fingernails that were black — kids remember that,” she said. He also wore a multicolored Mexican blanket like a poncho. As a carefree youngster growing up in Soho, she’d play hopscotch and tag in the streets. But whenever she saw him coming, she’d run and hide. He’d try to kiss her but she was repulsed by his facial hair. He’d always try to give her some sort of present, usually children’s books he’d found, but she’d decline. “I didn’t want his dirty books from the garbage anyway,” she said. According to the woman, the man would get close to young local children through their parents. And there’s one more thing she’ll never forget about him — his strange dark eyes. Now in her mid-30s and still living in New York, the woman requested that her name not be printed out of concern for her safety. The man, Jose Ramos, may get out of jail in November in Pennsylvania, where he’s been serving time on child-molestation charges. Ramos, now 68, has long been the number one suspect in the disappearance of Etan Patz, 6, from Soho 33 years ago. A suspect is in custody in connection with the disappearance of six-year-old Etan Patz more than 30 years ago, New York police have said, in what appears to be a major breakthrough in one of America's most famous missing child cases. Police say that the suspect has implicated himself in the case. Further details are expected to be released later today. The man is said to be known to investigators, according to NBC New York, and he worked and lived in the boy's neighbourhood when he disappeared in 1979. Ray Kelly, the NYPD police commissioner, said the man "has made statements to NYPD detectives implicating himself in the disappearance and death of Etan Patz 33 years ago." The breakthrough comes only a month after the FBI began a new search in connection with the case, one of America's most famous missing child episodes. The new search involved the excavation of a basement near his family's home. Etan was the first missing child to appear on the side of a milk carton. He vanished after leaving his family's apartment in Manhattan to catch a school bus. It was the first time his parents had let him go off to school alone. May 25, the day he disappeared, was declared 'National Missing Child Day' by Ronald Reagan. The boy was formally declared dead in 2001. A former convenience store worker confessed to luring 6-year-old Etan Patz from his school bus stop in 1979 and choking him to death in a basement, police said Thursday, ending a three-decades long investigation into one of the nation's most baffling missing-children cases. Pedro Hernandez, 51, of Maple Shade, N.J., was arrested on a murder charge after he told police he promised the boy a soda, took him to his store — just blocks from Etan's lower Manhattan home — and killed him there, Police Commissioner Raymond Kelly said. It's not clear if he had an attorney; an arraignment was expected sometime Friday. No one answered the door at Hernandez' New Jersey home Thursday night. The arrest is the first ever in the decades-old case that gave rise to the missing-children's movement and ushered in an era of anxiety about leaving children unsupervised. 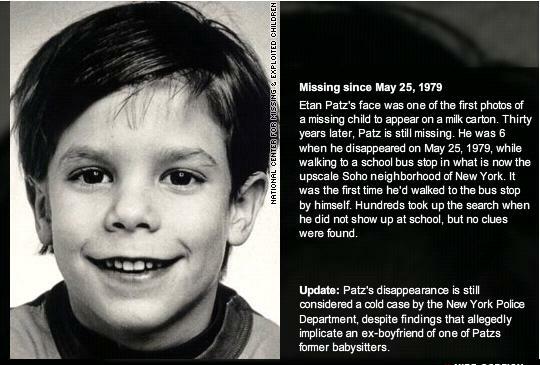 Etan's photo was one of the first of a missing child to appear on a milk carton. The anniversary of Etan's disappearance, which is Friday, was named National Missing Children's Day by presidential proclamation in 1983. Detectives are often barraged with hoaxes, false leads and possible sightings around the anniversary of the boy's disappearance. But Kelly said they believed Hernandez's story because of specific details he gave to police. Hernandez, then 19, had worked as a stock clerk at the store for about a month and wasn't questioned at the outset, Kelly said. But he later told relatives, as far back as 1981, that he had "done something bad" and killed an unnamed child in New York City, he said. After a search of a basement near Patz' lower Manhattan home last month hurtled the case back into the news, a tipster pointed police to Hernandez. Kelly said the person wasn't a relative, but knew that Hernandez had said he had done a bad thing, he said. Hernandez was known to police as being a worker at the convenience store — a popular fixture in the neighborhood — but was never questioned, though other people in the shop were. New York City Police Department detectives have arrested and charged 48-year-old Pedro Hernandez, of Maple Shade, N.J. with the murder of Etan Patz, who disappeared over 30 years ago on a short walk from his parents’ apartment in SoHo to catch his morning bus to school. According to USA Today, Hernandez told police that he choked Etan to death and left the boy’s body in a box. Hernandez is being charged with second-degree murder in the "online booking process." The Manhattan district attorney will ultimately decide the exact charges. Police questioned Hernandez after receiving a tip from his family members. He had told family members and friends that he "had done a bad thing and killed a child in New York City," but was not specific. His first statement may have been in 1981. Kelly said Hernandez told him he dumped the boy's body in the trash someplace else in the SoHo neighborhood. Hernandez gave no reason for choking the boy, Kelly said. No sexual assault is believed to have occurred. Hernandez has provided police with a written, signed confession. On the day Etan disappeared, Hernandez, then 18-years old, was employed in a store just blocks from Patz's home. … Hernandez admitted to luring the boy into the store with candy, strangling him, and placing the body in a box. He said he put the box out with the trash and when he came back later, it was gone. The NYPD lieutenant who informed Etan Patz's family that an arrest was made in the 33-year unsolved case of their missing son said the boy's father was surprised and overwhelmed, but handled the information "very well." "I don't know if you would call this good news, I think it would just be considered another piece of the puzzle," Lt. Chris Zimmerman said at the Thursday press conference where the NYPD announced the arrest of Pedro Hernandez, 51, of Maple Shade, N.J., in the case that had gone unsolved since 1979. Police say Hernandez confessed to luring 6-year-old Patz from the bus stop into a bodega where he worked with the promise of a soda before choking him to death in the basement. Police Commissioner Ray Kelly did not say whether Hernandez had a lawyer. Kelly said Hernandez told the NYPD that he put Patz's body in a plastic bag and disposed of it in the trash. Hernandez was questioned after the Missing Persons Squad received a tip from someone who remembered Hernandez speaking of having "done a bad thing" and said he killed a child in New York. A man arrested in the killing of a 6-year-old who vanished decades ago is expected to make his initial court appearance Friday, 33 years to the day the boy disappeared in New York. 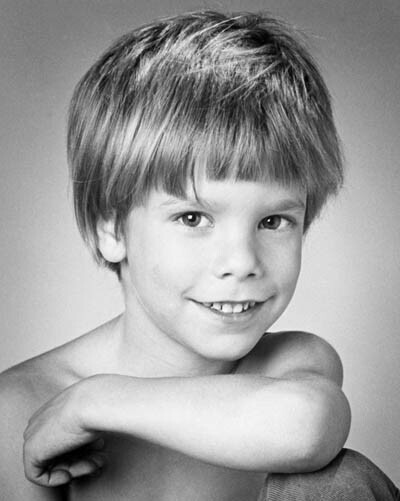 Etan Patz went missing on May 25, 1979, a block from his home in a Manhattan neighborhood. His disappearance helped spawn a national movement to raise awareness of missing children, which involved a then-novel approach of splashing an image of the child's face across thousands of milk cartons. Pedro Hernandez, a former Manhattan stock clerk who lived in his neighborhood, was arrested Thursday in connection with the death, police said. On Thursdays, he took out the trash. He smoked cigarettes on the landing. He waved to neighbors, but didn't say much. He shoveled snow and mowed the grass. The family had what appeared to be a graduation party last year for their daughter, now a college freshman. The most untoward thing anyone could recall didn't come from a neighbor, but a landscaper driving by the house Thursday, who alleged that Hernandez shorted him on payment for a summer's mowing three years ago. Authorities say Hernandez, 51, is the prime suspect in the notorious disappearance of 6-year-old Etan Patz in New York in 1979 after confessing to suffocating the child. He moved to New Jersey shortly after Etan vanished on May 25, 1979. The family has lived in Maple Shade for at least three years, neighbors said. "They're saying he confessed. If he confessed, he's been living in his private hell for the last 33 years," said Dan Wollick, 71, who lives in the duplex's front apartment. "If it's true, his life is over," said Wollick, a retired Waste Management truck driver. A man has told New York police that he suffocated a six-year-old boy who disappeared 33 years ago. Pedro Hernandez, who was detained in New Jersey, was being questioned about Etan Patz, who vanished on his way to school in 1979. Etan was last seen alive setting off to his school bus stop for the first time. His abduction caused widespread anxiety among parents about leaving children unsupervised. The boy's photo was one of the first of a missing child to be put on a milk carton in a national campaign to find him. Hernandez worked at a shop in the Manhattan neighbourhood where Etan lived and moved to New Jersey shortly after the boy disappeared. Hernandez said he suffocated the boy, then put his body in a box and left the box in an alley. NYPD Commissioner Raymond Kelly said further details would be released concerning the boy's death. "An individual now in custody has made statements to NYPD detectives implicating himself in the disappearance and death of Etan Patz 33 years ago," Mr Kelly said. The development was not related to the search of a Manhattan basement in April, said a source. That search yielded no obvious human remains and little forensic evidence. Jose Ramos, a convicted child abuser, who is in jail in Pennsylvania, had previously been the main focus of the investigation. Ramos had been dating the boy's babysitter at the time he disappeared. Etan's father Stan had his son declared legally dead in 2001 so he could sue Ramos, who has never been charged criminally and denies harming the boy. In 2004 a civil judge found him to be responsible for Etan's death. More recently, the focus had shifted to a 75-year-old Brooklyn resident, although he was not named as a suspect and denied any involvement. The man who has confessed to the murder of iconic missing child Etan Patz has a 'really short fuse', according to his brother-in-law, as dramatic new details about the famous case emerged this evening. Pedro Hernandez, who has been arrested on suspicion of killing six-year-old Etan when he was just 19, 'would get angry at nothing' when he was younger, his brother-in-law Jose Lopez told MailOnline. Hernandez's family appears to have turned on the self-confessed killer, as his sister insisted that he should 'pay for what he did' if found guilty of second-degree murder. The suspect, who is due to appear in court tomorrow - the 33rd anniversary of Etan's disappearance - claims to have lured the boy away from his bus stop by promising him a soda, according to New York police chief Raymond Kelly. Hernandez, now 51, took Etan into the basement of the bodega where he worked and strangled him, then wrapped the boy's body in a plastic bag and disposed of it near the store in New York's SoHo district. Mr Lopez, 58, told MailOnline that he was not sure whether or not his brother-in-law was capable of murder, but that he did not rule it out. He added: 'When he was younger Pedro had a really short fuse and would get angry at nothing. There was one time with his ex-wife when they had a row and he broke a window and I had to come round and fix it. 'I've known Pedro since he was about 10. When he was a teenager, when he's supposed to have done this, he was a tough guy and knew how to handle himself but he was hot blooded and he would snap. His wife Margarita Lopez, Hernandez's sister, said: 'If he did something he should pay for it. I have kids and if something happened to them the person that did it will have to pay. The man accused of murdering 6-year-old Etan Patz was hospitalized for fear he might attempt suicide Friday, the 33rd anniversary of the boy's disappearance, as investigators worked to corroborate his confession in one of New York City's most traumatic missing-child cases. Following decades of dead-end leads and false hopes among investigators, Pedro Hernandez was arrested Thursday after telling police he strangled Etan in 1979. At the time, Hernandez was an 18-year-old stock boy at a convenience store where Etan waited for his school bus. Hernandez, 51, of Maple Shade, N.J., was scheduled to be arraigned on murder charges Friday, a date now recognized as National Missing Children's Day because of the Etan Patz case. Police said Hernandez was taken to a secure wing at Bellevue Hospital to get medication for a pre-existing health problem, and doctors ordered him admitted after he talked about wanting to kill himself. Police would not disclose his health problem.